Panna cotta is a great dessert; it’s versatile and so easy to make. You can literally put anything in panna cotta – flavor it up with berries, fruit, chocolate, spices and even lavender. If you use a certain type of culinary lavender you can even make purple-pinkish colored lavender panna cotta. Unfortunately the kind of lavender I picked did not release any color. Lavender is commonly used in potpourri, scents, aromatherapy and cosmetics, but it also has great healing and insect repellant properties. Less commonly known, lavender can also be used in cooking. I personally love making lavender-thyme tea for the cold winter days and in summer lavender makes a pretty mean ice tea when you combine it with homemade raspberry sirup. You can even make lavender sponge cake or frosting. While I was on a hike in the countryside I came across an abandoned lavender field that was in full bloom. I picked a good bunch of lavender and dried it in anticipation of creating something awesome with it. So I came up with this yogurt lavender panna cotta recipe and I put honey on top because it goes amazingly well with yoghurt and I like to keep things a bit more healthy. 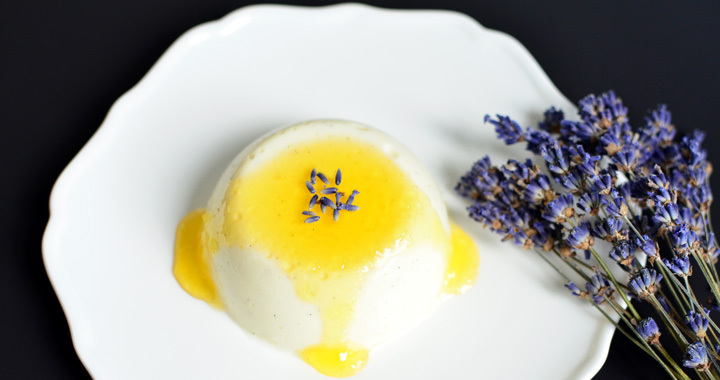 The flavors are great, the lavender is subtle but you can definitely taste it and the vanilla adds a wonderful and deep flavor to the yoghurt panna cotta. I designed the recipe not to be too sweet so that you can add a nice topping like a blueberry, rasperry or strawberry compote or as I did here, some liquid honey on top. If using powdered gelatin, add the gelatin to 3 tbsp cold water in a cup and let it sit for at least 10 min. You should add all the gelatin water mixture to the warm dessert later. If using sheet gelatin, add the gelatin to 3 cups cold water in a wide bottomed bowl and let it sit for at least 10 min. Don’t worry you can pile them up, but put them in the water one by one. When you add it to the dessert, lift the sheets out of the water 1 by 1 and put them into the warm dessert. Meanwhile, move to step 2. Put the milk, cream and honey into a small pot. If using a vanilla pod, split the pod in half and scrape out the seeds. Add the vanilla seeds/extract and the lavender flowers to the pot. Put the pot on the stove on low heat and bring it up to a simmer. Mix the milk and cream mixture every so often until the honey dissolves. You should keep an eye on the pot and take it off the heat as soon as you see it start to bubble. You don’t want to boil it. Let it cool a bit as you do step 3. Add the Greek yoghurt to a mixing bowl and whisk till it’s smooth. Then take the gelatin and add it to the milk-cream-lavender-honey mixture and mix it in well. Make sure you give it time to dissolve so mix it gently for a minute or two. Strain the mixture and then slowly pour it into the bowl with the Greek yoghurt while mixing. Lightly grease 6 ramekins with a neutral oil like sunflower or canola oil and then wipe them with a tissue. This will help get the panna cotta out of the ramekins later. Pour the panna cotta into the ramekins and place in the fridge to set for 6 hours or overnight. Take a ramekin and turn it over on a plate to let the lavender panna cotta fall out. You may need to loosen the edges with a knife and knock on the ramekin a few times to get the lavender panna cotta out. Top with some honey or a compote of your choice. What recipes have you tried out with lavender? Let me know in a comment below. I’m always looking for exciting new recipes to try and I’d love to feature your recipe. Get easy, healthy recipes and tips sent directly to your mailbox weekly. Posted in Dessert, Gluten free recipes, Recipes, Sugar free recipes and tagged easy desert, honey panna cotta, lavender panna cotta, panna cotta, vanilla panna cotta, yogurt lavender vanilla honey panna cotta, yogurt panna cotta.